Need more information about booking Home 35279 ? La Pergola is a child friendly 4 bedroom barn conversion approx. a 10 minute drive from 'Blue Flag' sandy beaches and just a 2 minute stroll (on the flat) to a great village offering bars/cafes & restaurants with twice weekly street markets. It is the ideal holiday home for families sharing due to the centrally located living area with the sleeping areas on different floors ensuring plenty of privacy. We specifically cater for families with children - an extensive library of books, lots of children's board games and toys from dressing up clothes to train sets, building blocks, dolls house & a great collection of classic and new family/children's films plus a swing ball in the garden for your evening family tournaments as well as baking and colouring equipment too for a fun afternoon....! For families travelling with young babies, we also supply within the price - a steriliser, bottle warmer, food blender, black-out blinds for the children's bedrooms, a travel cot, (& 100% cotton bed linen) changing mat, baby bath, high chair, push chair & children's crockery & cutlery. And for the grown-ups – Peace of mind that the kids are entertained in a safe, fun environment, baby-sitting and maid service available to really help you have the holiday you deserve, Plasma screen TV for you to enjoy, when they are tucked up in bed, Jacuzzi baths for you to relax in (we also supply the bubbles! ), internet access for planning tomorrows family adventure, Nespresso coffee machine for sublime coffee, plenty of magazines and books to read whilst relaxing in the sun, a Wii console for a fun game of tennis with your family and friends & of course….. plenty of wine glasses in the cupboard! This Gite has 4 bedrooms, 3 bathrooms and sleeps 8. It’s been listed on Holiday Lettings since 13 Aug 2007. Located in Vendee, it has 33 reviews with an overall rating of 5. The average weekly rate varies from £2285 to £4575. We loved our 10 days at Donna and Jay's rental in Angles. The area is wonderful, the house was immaculate and had everything we needed for an amazing vacation. The pool and hot tub are lovely and even though September was a bit cooler we did make use of them. They are very secure with fencing and locks so you can feel comfortable about the safety for small children. The town of Angles is tiny but has anything you might need and it is a very quick trip to the beach (7 mins by car). For a larger town experience La Roche sur Yon is approx. 30 mins. If you have children this would be an ideal location to vacation and the house is extremely well equipped with everything you'd need for small children, including beds, high chairs, toys, dressup clothes.... The house was perfect and we would highly recommend this for families. The detailed guidebook sent in advance of our arrival to La Pergola made it easy to plan our holiday activities. On arrival the children (7, 4 & 1 years old) were thrilled with all the toys, dressing up clothes and books that were all provided. The fact that these are all supplied meant we could pack lighter knowing they wouldn't miss their home comforts. The personal touches were excellent as was the cleanliness of the villa and friendliness of everyone. The owners were always on hand to help if needed and were very friendly. Sharing the pool with two other villas was brilliant as the kids play with each other while you relax. There’s enough privacy to have your own space and time away from the pool etc. The local area is amazing, there’s a water park and activity centre call the Indian forest which has enough activities for 3 full days out at least. There’s also go karting, horse riding beaches, play centres etc. We visited the bakery and cafe daily which was a short walk from La Pergola for fresh bread and wonderful coffee. Overall we had a wonderful family holiday which offered something for each of us from aged 69yrs to 1yrs! Thank you. La Pergola is in a great location, handy for the airport with great kids toys and amenities supplied. Secure areas were all very good and the heated pool and hot tub were fabulous. Very clean and lovely house, loved the village and nearby attractions. Beaches were great. Welcome hamper was very good. Staff very friendly. Great service from the whole team who helped with any questions we had and we will recommend as everything thought of! We spent ten days in La Pergola with only 4 adults and one child so we had very much room for us. Nevertheless the house would be large enough for 4 adults and 4 kids. The kitchen is well fitted with everything you need. For eating we had the choice of the table inside or on the terrace. Our holidays were in the end of September and the weather was still sunny and warm so that we could enjoy the deck chairs at the heated swimming pool and the almost empty beaches which are attainable within 10 minutes by car. In the evenings we used the hot tub and the nice little sauna. The house is situated in a calm area in a little town with small shops and some nice restaurants nearby. The hosts were very friendly and helpful in every way. Already the information we received in advance was perfect. Also the information about places to go, restaurants and any other things of interest in the region were very helpful. Wir (mein Mann, unser Sohn, meine Eltern und ich) hatten einen fantastischen Aufenthalt in diesem wunderschönen Ferienhaus. Donna (die Eigentümerin) war sehr freundlich und hat bereits während unserem Buchungsprozess all unsere Fragen schnell beantwortet. Gleich nach unserer Reservierung haben wir eine PDF Datei von Ihr erhalten in welcher wir viele interessante Informationen zu dem Haus und zu Frankreich und der Umgebung erhalten haben. Als wir angekommen sind konnten wir mit der "Lock Box" den Schlüssel holen und gleich ins Haus gehen. Das war sehr praktisch für uns da wir uns nicht an eine bestimmte Zeit halten mussten. Das Haus war wirklich sehr sauber und aufgeräumt. Wir haben uns gleich sehr wohl gefühlt. Hinter dem Haus war für unseren Sohn ein kleiner privater Spielplatz nur für ihn aufgebaut und auf einer Tafel stand sein Name. Das war wirklich sehr süß! Die Betten waren sehr toll dekoriert mit den Handtüchern die zu Schwänen gefaltet waren. Man hat sich fast wie in einem Hotel gefühlt. Die Ausstattung der Ferienwohnung war absolut genial!! Hier hat man wirklich gespürt dass die Eigentümer sich hier sehr viele Gedanken gemacht haben und Ferienwohnungen nicht erst seit gestern betreiben. Es war einfach alles da was man sich vorstellen kann! Die Küche ist sehr gut ausgestattet (wir haben einige Male gekocht) und man hat gleich z.B. ein paar Spültabs und Kaffee etc da und muss nicht gleich alles kaufen. Aber nicht nur die Küche ist super ausgestattet. Von den Spielekonsolen, den DVDs, etlichen Büchern, Kuscheldecken und einer kleinen Minibüroausstattung, ... im Wohnberreich über Duschgel & Shampoo, Babyöl, Töpfchen, Trittschemel, ... im Badezimmer bis hin zu den fantastisch eingerichteten Kinderzimmern mit etlichen Spielsachen, Malutensilien, Kostümen, Babyphone, Babybett, Buggy und vielem vielem mehr...Unser Kleiner konnte sich gar nicht satt sehen und hat jeden Tag ein neues Spielzeug für sich entdeckt. Wir hatten eigentlich auch selbst Spielzeug dabei aber das war dann uninteressant bei so viel Neuem :-) Da wir etwas in der Nachsaison da waren hatten wir den riiiiesigen beheizten Pool, den Whirlpool und die Sauna ganz für uns. Wir haben jeden Tag mindestens einmal den Pool und den Whirlpool genutzt. Es war immer alles sehr sauber und der Pool war trotz der Nachsaison und des etwas kühlerem Wetter sehr angenehm warm. Gut fanden wir auch, dass rundherum ein Zaun war und unser Sohn so nicht einfach plötzlich in den Pool fallen konnte. In Angles befinden sich ein paar Restaurants und ein paar kleinere Geschäfte sowie ein Supermarkt. Man kann hier also schnell in kurzer Zeit alles bekomme was man so braucht. Wir haben allerdings immer etwas größere Einkäufe gemacht und sind dann öfter bis "La Tranche sur mer" gefahren (ca. 10 Min Autofahrt) und dort in den größeren Super U gefahren. In "La Tranche" gibt es auch noch viele tolle Restaurants von denen wir auch einige besucht haben. Am besten gefallen hat uns das "Equinoxe" und das "Le Pousse Pied" Die Strände sind auch nur 10-15 Minuten entfernt. Wir sind sehr oft am Strand gewesen und haben das warme Wetter noch richtig ausgenutzt. Die Strände sind wirklich absolut traumhaft! Wir waren unter anderem schon in Kalifornien und in Mauritius und vielen anderen Traumstränden, aber die Strände in Frankreich können hier locker mithalten! Einmal haben wir einen Ausflug nach "La Rochelle" gemacht. Das ist eine wirklich sehr schöne alte Stadt. Es gibt sehr viele schöne Restaurants und Cafés und ein wirklich sehr tolles Aquarium. Uns hat es auf jeden Fall wirklich unglaublich gut in Angles und in "La Pergola" gefallen! Wir kommen sicher wieder! 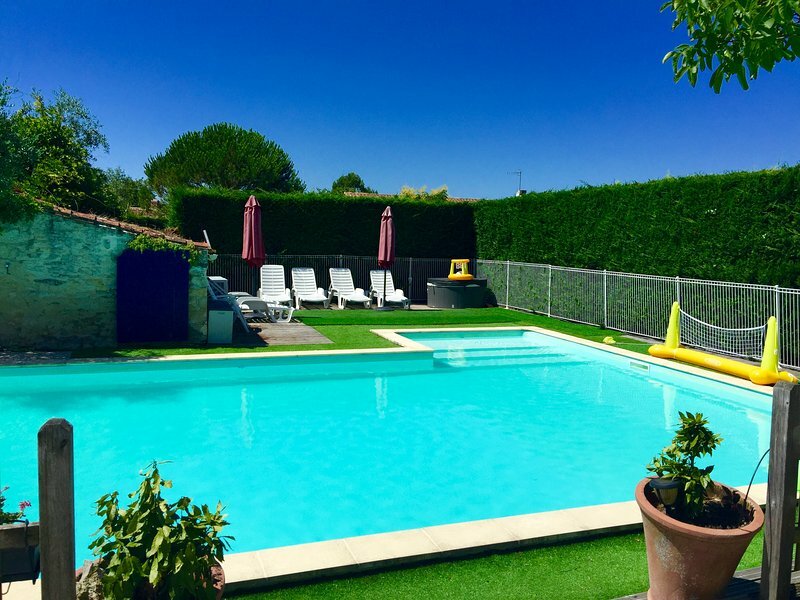 What a lovely and easy holiday we've just had at La Pergola - We've just returned from this spectacular gite, in the best, most family-friendly area. The location is suburb, the facilities excellent, and the experience made for an incredible stress-free holiday. A 'home from home' experience in a stunning part of France. We'd highly recommend this company to anyone with a young family after this wonderful holiday and intend on using them again! My wife and I were celebrating our 25th wedding anniversary but only had a narrow window of time so we wanted it to be extra special. We travel from the states to Europe on a frequent basis but usually to the larger cities. We saw the description of La Pergola, located in Angles, France and thought we'd give it a shot. We are super glad we did! Do not let the "barn conversion" label fool you. This is a first class home that is well-equipped (especially the kitchen), has extra comfy beds (great for naps after polishing off a bottle of wine) and is in a small, quaint village. We loved walking from the home and buying pastries from the local patisserie (or two). We took a short drive to the several open markets in the surrounding villages and tried several restaurants - all amazing. We were here by ourselves and will come back with our friends, however, the home and setting is perfect for families. Talk about an amazing beach vacation to do with your kids (or, in our case, grand kids....someday)!!! As good as the location and home were the service and hospitality was even better! Donna and Jay were professional, proactive and thoughtful hosts. We enjoyed getting to know them and hope to see them again when they travel here. The worst part of the vacation was having to leave. But we'll remedy that with a return trip soon!!! We had a wonderful weeks stay at Pergola. It's perfect for families as it has such a safe environment. We had family who stayed in Le Palmier which was great as the children could safely go between houses without us having to worry. The team managed to finish their clean earlier than the check in time of 5pm which was brilliant so we could get in earlier. We arrived to a lovely welcome and even the train set was laid out and ready to go. Our one year and three year old loved all the toys there was to offer and it was great to have all the baby equipment to use. A visit to the market in Angles is a must and Tranche-sur-Mer has a great beach less than 10 mins away. Definitely recommend for families!